Don't forget to consult the WebGL spec and OpenGL ES 2.0 man pages for important details on how WebGL API functions are supposed to work. Links to both are provided on the main page for your convenience. Sometimes the notes will provide a link to the man page for an API function when it is first introduced, but you will not see the navigation frame to jump to other man pages. Caveat Emptor: I have found errors in some sections of the man page in the past. I cannot guarantee their correctness. Before you begin this seminar, create a new template project like you did in the first lab - like the first one before you added triangle code. You will complete the project by following the instructions in this lab's notes instead. Optional: if an updated DC/RC request mechanism is included with the driver, request it with the active RC and repeat the process to get a fully capable OpenGL. What are DCs and RCs? A DC is simply a data structure that keeps the state of the current settings of and routes calls to the appropriate device. An RC is a data structure that keeps the state variables for OpenGL. It is also a portal through which OpenGL calls are sent to the device. You can think of both DC and RC as a data structure that keeps the state of current OpenGL settings and routes calls to the proper device. What is a pixel format? Pixel formats define the translation between OpenGL calls (such as an OpenGL call to draw a pixel with an RGB triad value of [128,120,135]) and the operation that the rendering system actually performs (the pixel might be drawn with a translated RGB value of [128,128,128]). They are also a description of all the hardware features you want OpenGL to provide to your program. The selected pixel format describes such things as how colours are displayed, the depth of field resolution, and what additional capabilities are supported by the rendering context you have created. Click here for a more involved discussion of pixel formats in Windows. Although WebGL doesn't let you change all of the things a full pixel format would, you can request some pixel format features when you issue the getContext command by providing an optional Context Attributes argument. The WebGL Specification provides a full list of context attributes, their defaults, their purpose, and an example of use. The Rendering Context object is acquired with the getContext function built into HTML5 canvases. This function may also provide access to other types of renderers. To be sure that the function is called correctly on older web browsers, and to handle cases where it fails, Google's cross browser webgl-utils.js provides setupWebGL() which wraps getContext(). For a full list see the section on The WebGL Context in the WebGL Specification or check the Mozilla Developer's Page on WebGLRenderingContext. Before you can do any drawing you need to tell WebGL what to do with the things you tell it to draw. You do this with shader programs. WebGL uses OpenGL ES Shading Language 1.0 as its shader programming language. It is a modified version of GLSL 1.2. Shader programs consist of a minimum of two parts: a vertex shader and a fragment shader. You may also have heard of two other shader types: geometry shaders, tesselation shaders, and compute shaders. Geometry shaders were introduced in OpenGL 3.2 Core Profile, tesselation shaders were introduced in OpenGL 4.0 and compute shaders were introduced in OpenGL 4.3. They are optional in all versions of OpenGL and are not available at all in WebGL, so they will not be covered in these labs. You will send lists of vertex information into a vertex shader. This information comes in through variables labelled with the attribute modifier. This information represents attributes of the vertex that can change from one vertex to the next such as colour and position. In newer OpenGL programs, vertex shader inputs are simply marked in. When we are done manipulating and creating shader properties, we pass the results along to the fragment shader through outputs labelled with the varying modifier. The vertex shader outputs for the vertices in the same primitive will be interpolated across the primitive - if they weren't all the same their values will vary from fragment to fragment. In newer OpenGL programs, vertex shader outputs are are simply marked outs. //Add default z and w coordinates to the incoming position and pass it on. This vertex shader only has one input which represents a 2D coordinate for the vertex. This coordinate is in a 2 component vector which has a base type of float. Vertices can be moved around in space, coloured, and lit by the vertex shader. You will explore many of these things later. For now, our vertex program will only provide a colour for the vertex. This colour is hard coded and will be the same for all vertices. You will learn how to change this colour programmatically later on. Our first vertex shader uses two outputs as well. You can see the declaration for a 4 component vector, vec4, for colour, and we use the built-in output gl_Position, which is also a vec4, which is why the shader adds two more components to vPosition when we assign it to gl_Position. All vertex shaders have a second built-in output, gl_PointSize which controls the size of points. It's value controls the point's width in pixels. The fragment shader gets data that is blended from each vertex that makes up the primitive being drawn. This could be a position somewhere between each vertex, a texture lookup coordinate, or a blended colour. For now our shader will ignore the built-in inputs and simply copy the incoming colour to the screen. varying  vec4 color; //The blended fragment colour from the vertex shader. //a varying output from the vertex shader. This fragment has one input for the interpolated colour. It is important that names for the inputs you create in a fragment shader match the name of an output you create in the vertex shader. There is a built-in 4 component output vector, or vec4, called gl_FragColor that you should set in most fragment shader programs to provide the colour output for the fragment shader. If you don't, the output colour will be undefined. gl_FragData[n] - used instead of gl_FragColor to send different outputs to varied custom output buffers for more advanced rendering techniques. Drawing with one of these types is controlled by a drawArrays or drawElements function. The drawArrays function tells your rendering context to begin drawing a certain number of elements from a list of vertex data that has already been loaded into an array buffer object and connected to appropriate shader inputs. The drawElements is similar, but requires an additional element index buffer that allows you to access the data in the vertex arrays out of order - this is the last you'll hear of drawElements in the labs. Regardless of which you use, to be able to draw you will need to know how to load vertex data into a buffer, and how to attach it to a shader attribute. The number of coordinates provided per vertex should match the vec type specified on the position input of the shader you are using. If it doesn't, it may be padded to fit. They are also easily concatenated with the concat method, which comes in handy for packing multiple drawable objects into one buffer. Must be flattened before sending to a buffer. Once you have some vertex data, you need to load it into buffers. Each array can be loaded into a separate buffer, or all the arrays can be packed into the same buffer. You will find examples of both in various code samples in your textbook. For now, we will use two separate buffers: one for vertex positions and one for vertex colours. To create a buffer, you use the createBuffer (similar to the OpenGL ES glGenBuffers command. createBuffer() creates a valid buffer name which you must bind to load with buffer data or attach to a shader attribute. Once you have a buffer name, you bind it with bindBuffer. A buffer is not allocated until you bind it the first time. Where target indicates what type of data the buffer holds - either ARRAY_BUFFER or ELEMENT_ARRAY_BUFFER - and buffer is a valid buffer name generated with createBuffer(). You will use the target type ARRAY_BUFFER for storing all vertex data in these labs. With the buffer bound, you are ready to load data into it with glBufferData. This function comes in two forms form 1 specify buffer size and initialize with 0s, and form 2 initialize from a data source - like a flat array. usage indicates how the data will be used. Since you will likely use your buffers for drawing simple geometric objects, you will generally specify the STATIC_DRAW usage type. If you plan to update the buffer frequently, you might want to specify DYNAMIC_DRAW. If you plan to use the buffer infrequently you should specify STREAM_DRAW. A buffer's data may be updated with another call to bufferData() or with a call to subBufferData(). If you plan to update only a portion of a buffer's data, consider using glBufferSubData. Once a buffer is loaded with data, it must be attached to the correct input in your shader program. To do this, you ask for the input by name, enable it, then attach your data in the currently bound buffer to the input with a description of how the data is formatted. To get a reference to a shader input you use getAttribLocation. Where program is a valid, compiled shader program, and name is a character string containing the name of the desired shader input. If name does not refer to a valid input in the specified shader program, the returned result will be -1. WebGL restricts shader names to a maximum of 256 characters and trying to request on with a longer name will also result in -1. To enable the shader input you use enableVertexAttribArray. Where index is a valid value returned from getAttribLocation. To attach the currently bound buffer to a shader input you use vertexAttribPointer. index is a valid value returned from getAttribLocation. size is the number of components being sent per vertex. Must be 1, 2, 3, or 4.
type is the data type of the components. You will usually FLOAT, but for colours UNSIGNED_BYTE is helpful because it allows you to specify values from 0 to 255 instead of 0 to 1.
normalized is for integer data and doesn't apply to the type FLOAT, so use FALSE with FLOAT type. It will cause integer type data to be mapped to a float with values between 0 and 1, which is how shaders expect colours to be formatted. stride indicates the number of bytes between values that apply to this shader input. This allows us to send interleaved data. If your values are tightly packed, use 0 as your argument. offset is the offset in bytes of the first relevant component in your buffer. If you are using separate buffers for each vertex attribute (color, position, texture coordinate, etc), this should be 0. The purpose of the size and type arguments is to describe the data being sent to the shader. If the original data doesn't match what's asked for in the shader, it will be converted for you. In fact, all vertex attributes are converted to size 4. If y or z are missing, they become 0, and if w is missing it becomes 1. You can then define an attribute in the shader of a different size depending on your need. Finally, to draw things, use drawArrays. count is how many vertices to draw. If you have done everything to this point you should see a red triangle in the upper right corner of an otherwise white rendering canvas. Now it'ss time to experiment with different drawing modes. You can control the size of the points by setting the value of the vertex shader's built-in gl_PointSize output. Although the WebGL specification only requires points of size 1, nearly all WebGL implementations allow a much wider range because textured points form the basis of many interesting effects. LINES — draws a line segment for each pair of vertices. LINE_STRIP — draws a connected group of line segments from vertex v0 to vn connecting a line between each vertex and the next in the order given. LINE_LOOP — similar to LINE_STRIP, except it closes the line from vn to v0, defining a loop. Some WebGL implementations let you control the width of lines with lineWidth(). Most Macs implement the minimum range of line widths-, 1.0 to 1.0. You may find that your PC allows more. cullFace() — if CULL_FACE is enabled, this specifies which sides of a triangle to discard, FRONT, BACK or FRONT_AND_BACK. frontFace() — specify whether clockwise, CW or counter-clockwise, CCW point drawing order means a triangle is facing front. TRIANGLE_FAN — draws a strip of triangles connected about a common origin. The first three vertices define a complete triangle. Each subsequent vertex completes a triangle with the previous and the first vertex. It may be hard to see why you get the results you observe. Consider the order the points are defined and how triangles are defined for each triangle type. So far our shader has used a hard coded colour. You can change this colour in a running program in one of two ways: uniforms and attributes. These are explained below. All our colours will be in RGBA format - Red, Green, Blue, Alpha. Alpha is an extra term used in blending operations. You can think of it as "transparency", but it can do more than that. The alpha channel will be ignored in our programs this week. A uniform is a shader value that has a constant value during a draw operation, but can be changed between draw operations with WebGL commands. Uniforms can be declared in vertex and fragement shader programs. uColor = gl.getUniformLocation(program, "uColor"); //And put this in init. (optional) a v to indicate that you are passing in an array of values. The process is very similar to the position buffer set up. I have highlighted the differences in red. In this lab you will be drawing 2D objects. When you draw in 2D (or you are doing 3D CAD work) you should use a special geometry transformation that does not cause shape or size distortion. This transformation is called orthographic projection. In the last lab we wanted a 3D effect with foreshortening so we used perspective projection. Perspective transformation makes it hard to place things precisely on the screen. Shapes are distorted toward the edges and corners, and their apparent size varies with their distance from the camera. With orthographic projection you can precisely control how coordinates map to the drawing area, and objects render the same way regardless of distance. This week, we will use only simple normalized device coordinates - our drawing space will lie between (-1,-1) in the lower left corner and (1,1) in the upper right. If you are using 3D coordinates, then -1 is the nearest possible Z coordinate, and 1 is the farthest. Things do not appear smaller with distance. Next week, when you learn to do perspective() projection and other transformations, you will also see the textbook's ortho() functions which can give you control over how coordinates are mapped to the window when you don't do perspective. In the last two sections we've discussed how to clear the depth buffer, and the default range of depth values. Perhaps you'd also like to know how to specify 3D vertices and do depth testing. Without depth testing, objects appear on the screen in the order you draw them. If you want to draw something behind another thing you have already drawn, you need to turn on depth testing, supply depth values with your vertex coordinates, and clear the depth buffer each time you start drawing. Clear the depth buffer along with the colour buffer as described above. Supply a non-zero depth to the vertex shader by making sure that the vPosition attribute is a vec3 or vec4. Then make sure you adjust how it is copied to the gl_Position built-in output. Make sure you are set up to use a colour input attribute as discussed earlier. Make sure you are drawing the six points specified. Change the size component of the vertexAttribPointer call for your position buffer to match the points array. It was 2, it should be 3 now. If everything works, the cyan triangle in this example appears behind the red, even though it is drawn second. In the default coordinate system, larger z values are farther away. With depth testing off, the cyan triangle would be in front of the red one. It is good to get a feeling for where you can put points on the scene. Modify the shader in the project as described in the Setting Up a Shader Program section of the lab 2 notes. Confirm that you can draw the triangle with the original shader code. Use the first drawArrays() command found in the notes, and place it in the render() function as described there. Add either a uniform or an array input to your vertex shader to allow you to change colours. Colour the triangle and rectangle with the colours of your choice. Add glUniform*() commands, or set up and load a colours array as appropriate to accomplish this task. You may remove the drawArrays() command that draws the triangle. Please leave the rectangle border in place. Consult the marking scheme to see what else to do. /6 - Draw a picture that contains at least three of the various OpenGL primitives. It should look very different from any in-lab demonstrations. /3 - Use at least 3 different colours. Do this with a uniform shader variable or a vertex colour array input. /2 - Write code that would draw at least two different line sizes. Tell me in a comment whether or not it worked, and on what OS+graphics card combination. /5 - Artistic impression - your drawing should resemble something and reflect some effort. Samples of previous work. Your work will end up in the gallery, so pay attention to artistic impression. BONUS: Add at least one extra useful uniform to your program. You could use such uniforms to adjust the position, size or rotation of objects you draw with draw commands. Try something. I like being surprised. 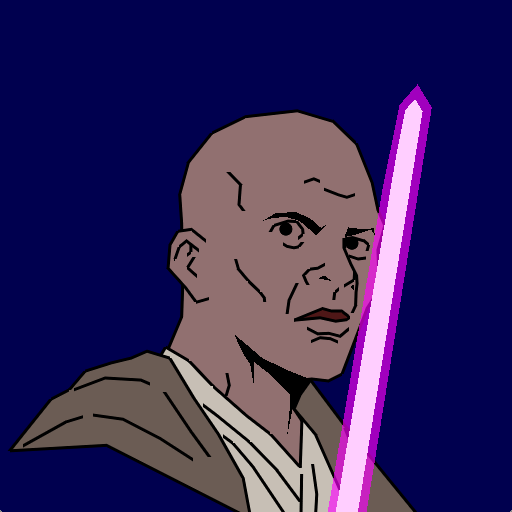 BONUS: See if you can figure out how to perform Alpha Blending with WebGL to achieve transparency effects, like what you see in the glow of Mace Windu's lightsaber from the previous work gallery.